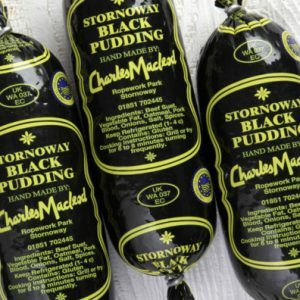 The famous Stornoway Black Pudding from Charles Macleod’s Butchers. An essential part of any winter’s morning cooked breakfast. Or do as we do and feed it to the children for their tea – they seem to eat anything if ‘pudding’ is in the name. Charles Macleod (or Chalie Barley as they are known) butchers in Stornoway has a long history stretching back over six decades. Their ongoing success has been built on two firmly established principles: top quality meat and excellent customer service and attention to detail. Multi award winning including six Gold awards from The Guild of Fine Food. 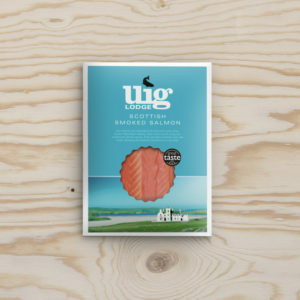 It is made with Scottish oatmeal to give it a unique texture and the moist deep flavour is a result of high quality ingredients and fine balance of seasoning. The business is still very much a family affair being run by sisters Ria and Shona and their cousin Rona. 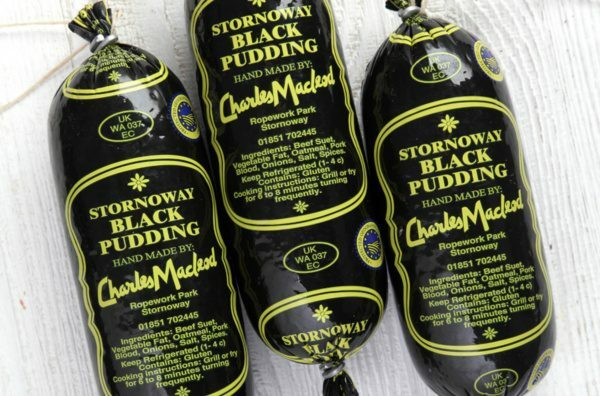 They fought hard and were finally rewarded with a ‘protected geographical designation’ for Stornoway Black Pudding. Cooking instructions: Grill or Fry slices for 8 minutes, turning regularly until cooked through. Storage Instructions: Refrigerate on delivery. While the black pudding is sealed it will stay fresh until ‘use by’ date. Once the skin is broken please consume within one week. Suitable for freezing for up to 3 months. We recommend you slice and wrap portions for freezing.